I've long been a fan of ToeSox, a company that offers footwear and handwear for people who practice yoga, Pilates and dance. So when I discovered that the company had come out with a line of flip-flops (which I'm also a fan of), I jumped at the chance to try out a pair. These aren't your typical flip-flops. These sandals have not ONE toe thong but FOUR on each foot. This means there is a small bit of webbing between each of your toes. If you have had toes cramped in heels over the years, and they could use some gentle separating, these would be your sandals. You know how the first few times you wear flip flops each spring your feet have to get used to the feel of the thong between your toes? Well it's like that with ToeSox Five Toe Sandals, too. In fact, the sandals come with a card that says, "Give 'em a week for happy feet" -- which is great advice. Don't plan on taking them on a long walk your first time out. Plan to break them in with short bursts of walking. After about 5 days, I felt like my feet owned the ToeSox. And oh emm gee, how comfortable the footbed is. It's like walking on a yoga mat all day. Just the right amount of cushion and support. foot posts naturally align toes and feet for proper bone alignment to help correct a variety of foot, back and leg ailments. What's more, they look great. The Kirra ($40), which I tried, comes in three colors, one of them purple, and the Yogini ($30) comes in four. For a different look, try the Bohemian ($50) in sand or in black. There are also options for wedges and for men's styles. My toes and I give ToeSox Five Toe Sandals an enthusiastic thumbs up. Giveaway! ToeSox is giving one AllThumbsReviews reader (who has a US shipping address) a pair of Five Toe Sandals. If random.org chooses your comment number, you'll get to select either the Kirra, the Yogini or the Bohemian. How to enter? Just check out the ToeSox store and leave a comment on this post telling which Five Toe Sandal you'd like, as well as the color. Leave your comment by August 24 and make sure we can reach you by email. Winners will be announced in this space the weekend of August 25-26. Following is a blurb you can tweet or share on Facebook. For extra entries, let us know you've spread the word by leaving a second (or third) comment. Disclaimer: I was given a pair of Kirra sandals to try in exchange for an honest review. UPDATED: Once a Mother, come on down! I LOVE the Kirra wedges in black denim. Just sayin. 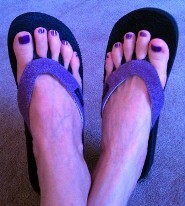 I love my flip flops and would totally jump at the chance to own another pair, especially comfy wedges! Oh I like these! What a great idea, and I have wide feet so the chance at getting some space between my toes, when they are usually jammed in my shoes, sound divine. How interesting and fun! If I am lucky enough to win, I would love to try the Yogini in Camel. I would love the Kirra in purple...size 8 pretty please. love the boheiman in sand. These are super cute! I like the Kira in Blue... they'd look great with jeans! Ack! My toes like to hang together! Well, except for that big one - it's kind of an outcast. :) But I do like anything in purple...so maybe trying the Yogini would be interesting. Ooh, I'm digging the yogini wedge. I think it was the vegan leather strap that got me. Those look super cool. I think the sand color Bohemians look really interesting (and comfy). I also love the look of the wedges. love the Bohemian Womens in sand!